De Sitter spacetime (DS) is an exact solution of the Einstein's field equations of general relativity that describes a spatially flat, empty, expanding universe with positive cosmological constant; it is conjectured to model the universe both at the Planck era (at time .) and in the far future at thermodynamic equilibrium. De Sitter spacetime with one temporal and one spatial dimension, denoted , can be represented as a two-dimensional hyperboloid embedded in Minkowski spacetime , with one temporal and two spatial dimensions; the former inherits the Lorentzian pseudometric of the latter. The Demonstration illustrates the fact that, in de Sitter spacetime, space grows exponentially with time. 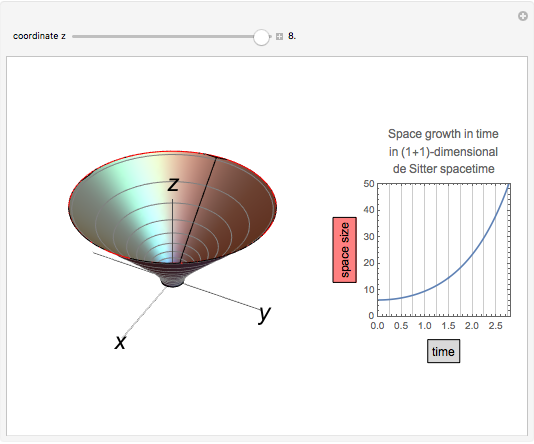 When 2D de Sitter spacetime is depicted as a hyperboloid embedded in 3D Minkowski spacetime , space is the circle (red) obtained by the intersection of the hyperboloid and the plane in with constant coordinate; space size is measured by the length of this circle. Time flows upward, and since the hyperboloid surface appears to straighten up as time proceeds, we might erroneously conclude that space and time are related almost linearly. In fact, this would be true if we considered the time associated to the axis in Minkowski spacetime . But in de Sitter spacetime , time flows upward on the hyperboloid surface, experiencing an ever-increasing angle with the axis of : due to the Lorentz pseudometric of the latter ( ), this increasing angle implies a progressive slowdown of time (recall the twin paradox of special relativity). The exact relation between time on the hyperboloid and coordinate in turns out to be . The inverse relation , the fact that the red circle grows approximately linearly with , and the equation explain why, in de Sitter spacetime, space grows exponentially with time . A recent interesting paper on the relations between de Sitter spacetime and complex networks is . D. Krioukov, M. Kitsak, R. S. Sinkovits, D. Rideout, D. Meyer, and M. Boguñá, "Network Cosmology." Scientific Reports, 2(793). arxiv.org/abs/1203.2109. Tommaso Bolognesi "Inflation in 2D de Sitter Spacetime"